Times have changed for clowns. I have been reading about the scary clowns in the papers and seeing reports about them on TV. I remember, many decades ago when I was a kid, that clowns were fun and funny. I remember them in parades driving small cars and doing stunts to make people laugh. There was an interesting article in the New York Times the other day titled, What Do the Scary Clowns Want? 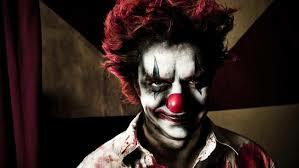 The article discussed the current trend of scary clowns and traced their origins. I was surprised to learn that scary clowns go back into at least the 16th Century. The current scary clown epidemic had caused one of the most beloved clowns to go into hiatus--Ronald McDonald has been placed in retirement. 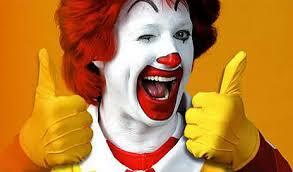 The Washington Post reports that Ronald McDonald is laying low until the current clown scare is over. I imagine that it is going to be a very interesting Halloween--I'm not sure whether scary clowns or creatures are going to be in the biggest numbers, although Target has halted the sale of clown costumes and masks. I guess the phrase "clowning around" may have a new and more sinister meaning.